Need CD’s in a hurry with outstanding quality then our short run CD duplication is for you! Over the last seven years Discburner’s reputation for delivering short run cd duplication has become relied upon by our customers. Our facilities include high resolution disc printing, an industry standard Xerox digital press. Our inline finisher enables us to produce the highest quality product. From receipt of your master and artwork your project will be completed in as little as 48 hours. We use a timed next day delivery service, so you know exactly what time your CD duplication will arrive. The one hour delivery schedule has proved invaluable to our clients who need CD’s for presentations or conferences and have no room for delay. 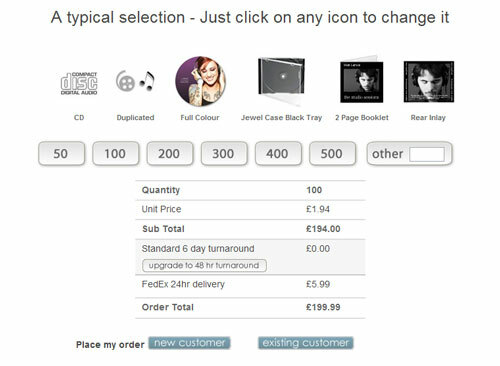 You can easily put together a cd duplication instant quote with our pricing tool. We believe it’s the easiest to use in the indusrty! How do I order short run CD duplication? Ideally masters should be sent in to us by registered mail. However, we can help you to prepare a digital image that can be uploaded directly through your Discburner account for urgent short run CD duplication orders. For data files such as PDF’s that need to be copied to disc then they too can be uploaded directly through your account. When your payment has been received and your artwork and master checked the run will commence. Artwork is checked during the run to ensure the best reproduction of your work. The final packaged product also undergoes a final quality check before being dispatched. You’ll be notified by email when your short run CD duplication order has been dispatched and telling what time within and hour it will arrive.